BlackBerry Pearl 9100 to have full QWERTY keyboard? | BlackBerry Blast! BlackBerry Blast! > News > BlackBerry Pearl 9100 to have full QWERTY keyboard? BlackBerry Pearl 9100 to have full QWERTY keyboard? Is RIM about to offer a full QWERTY keyboard for the BlackBerry Pearl 9100? If you believe Al Sacco of CIO.com they are. Sacco posted some images he found at a Chinese cell phone parts reseller called TrueSupplier. 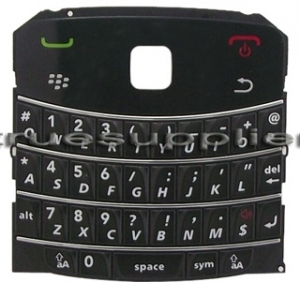 The image is labeled "OEM Blackberry Pearl 9100 Keyboard Keypad Black." Does this mean that the BlackBerry Pearl is about to offer a full keyboard? Maybe. The BlackBerry Pearl has historically relied on a "SureType" keyboard that squeezes multiple characters onto single keys. Software on the phone predicts which letters you need and helps you along. Could RIM abandon this technology in favor of full QWERTY keyboards on their smaller devices a la, the Palm Pixi? There's no official word from RIM, but it's certainly possible.